If you are looking for a peaceful escape from the crowds, head over to Anafiotika. 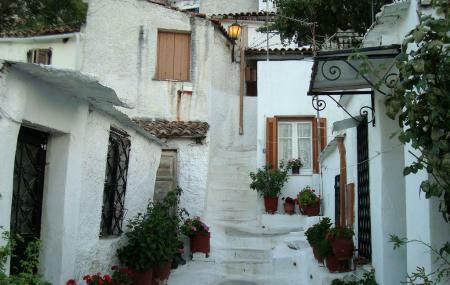 It is a neighbourhood, rather, a peaceful small community in Athens with Cycladic island style houses. You might find artists and painters lining the cobbled streets to capture the rustic, calm beauty of the place. Situated on the northern slopes of the Acropolis hill, beside the entrance to the Agora, head over to Anafiotika for a leisurely stroll and enjoy a peaceful meal at one of the few cafes that the area has to offer. Try to maintain the tranquillity of the area. Wear flats or walking shoes as the area needs to be explored on foot. People normally club together Water Fun, Aqua Park and Garbi Restaurant while planning their visit to Anafiotika.